Cheers Restaurant in Hong Kong: Wedding Themes, Anyone? We were out scouting the Nathan Road area for breakfast, and chanced upon this endless stream of people going in and out this building. Most of them were leaving with happy faces and belly laughs. So we followed the stream and found that indeed, they were heading to a restaurant. 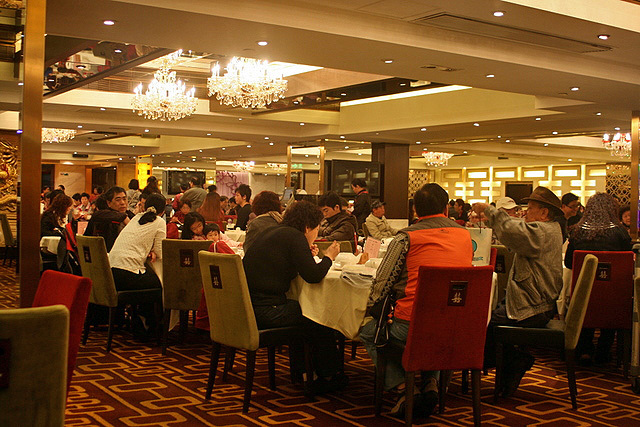 Cheers Restaurant, a two-storey massive banquet hall that was so full, we had to wait (and eventually share a table). 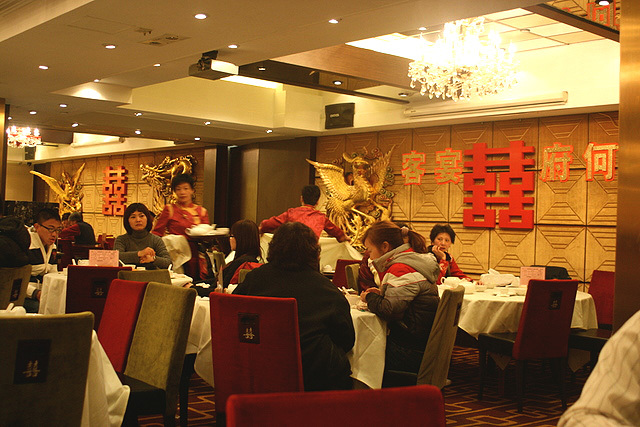 I later found out that Cheers is Hong Kong's first Chinese wedding banquet themed restaurant. Say what? Wedding banquet as a theme? I'd thought they had just forgotten or didn't bother to take down the decorations that must have been used by a wedding the night before or something. I'd understand if the setting was more historical, maybe with older furniture and wooden rafters. That would at least be more interesting. This is too modern, like dining in a mass market ballroom. Still, the hordes were coming for this. Maybe the food was good. OK, honestly, it looked decent but was not as good as I'd hoped. Maybe you need to know what their specialties are (and we didn't). 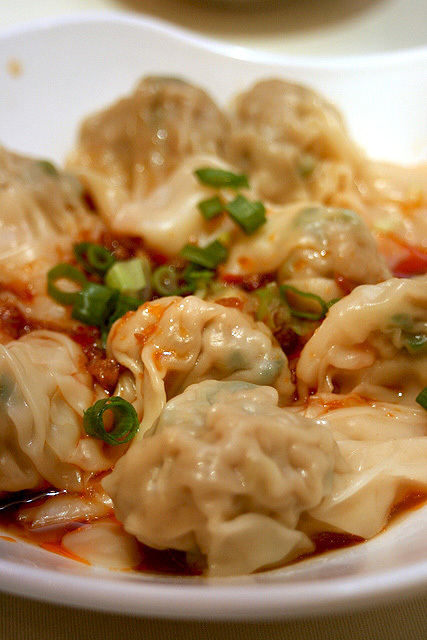 We kicked off with steamed dumplings in spicy oil. 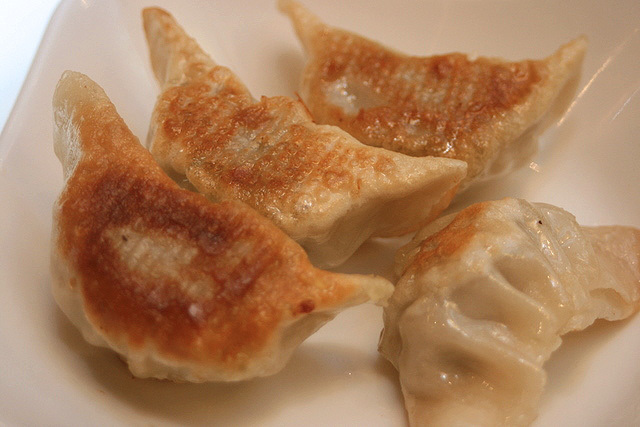 Pan-fried dumplings (gyoza style) were a bit dry. 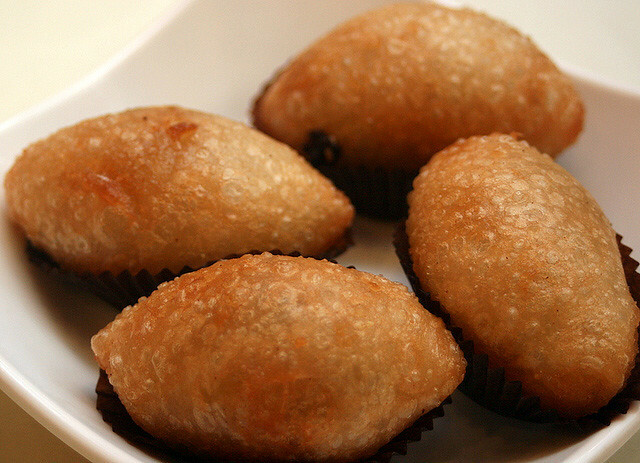 Ham sui kok or deep-fried dumplings. I've had better, and I've had worse. 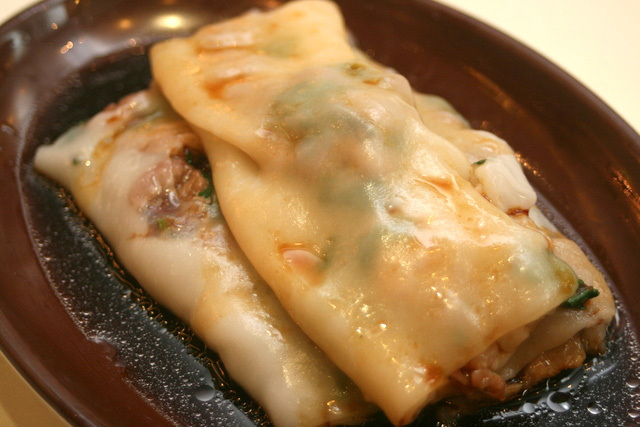 The cheong fun is not too bad. 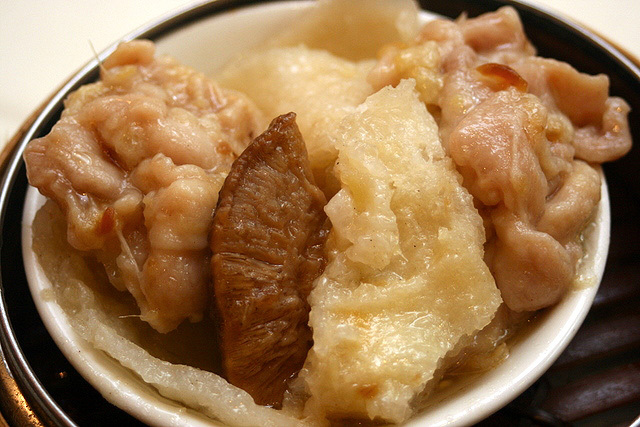 Braised fish maw with mushroom and chicken (or at least I think it's chicken). I just wanted the fish maw. 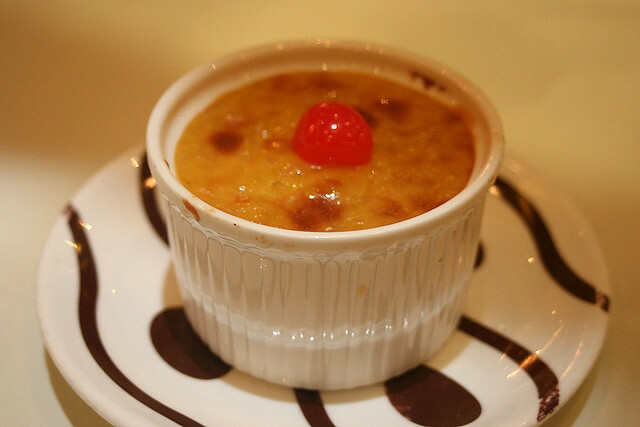 Not too much in the way of desserts, but they do have an odd choice of creme brulee. I have to guess that people were coming here because it was affordable. We spent less than HK$200 for two persons in all, inclusive of tea. Cheers Restaurant is a chain belonging to the big Tao Heung Holdings which also includes many other restaurants like Pier 88, Hak Ka Hut, Chao Inn, and oh my god, the Tai Cheong Bakery that's so famous for its egg tarts. Yes, I tried those too...coming up in a separate post. Shop Units 203, Paradise Mall, 100 Shing Tai Road, Heng Fa Chuen, H.K. 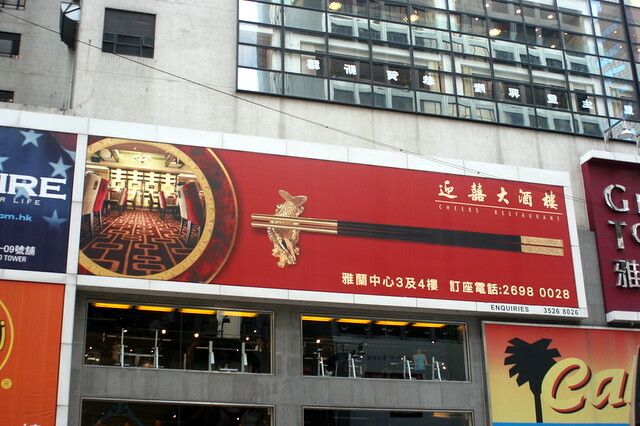 Shop A, 3/F & 4/F., Grand Tower, 639 Nathan Road, Mongkok, KLN. 1/F., Nathan Hotel, 378 Nathan Rd., KLN. Shop 136-150, Level I, Zone B, Tai Po Mega Mall, 8 On Pong Road, Tai Po, N.T. Shop 601-613, Level 6, Tsuen Wan Plaza, 4-30 Tai Pa Street, Tsuen Wan, N.T. Shop 204, 2/F, Hau Tak Shopping Centre, Tseung Kwan O, N.T. Shop 541-555, Level 5, Metroplaza, 223 Hing Fong Road, Kwai Fong, N.T. 5/F, Windsor House, 311 Gloucester Road, Causeway Bay, H.K. Yes, I think it is! Wow, it's been around that long, huh! I hear Cheers is where the locals go, and that before 11.30am, everything is half price! I love chinese food. Although I'm not familiar with all the food they served, still everything is worth trying. This post is very helpful because I'll be marrying my Chinese boyfriend next year. I think I'll have Suffolk County catering halls to serve Chinese foods but I'd like to avoid the oily dumplings.